Hello people…! In this post I will explain you how to find the shortest path to win the Snakes and Ladder game by using the Breadth First Search (BFS) Algorithm. If you don’t know the algorithm, I suggest you read my post about it. Now, Graph Theory has many applications and I love working with things that have real-world applications, well, off course the other data structures too have their uses but the speciality of Graph Theory is its applications have the closest association with our day-to-day activities. And to show you this and to set an example on how the BFS is actually put into action, I am taking up the example of the very popular game, Snakes and Ladder. Now, this game needs no introduction. We all must have played it in our childhood. I will explain you… How by using Graphs and BFS we can find the Shortest Path to win the game, and, we will state that path and the number of moves of dice it takes too. 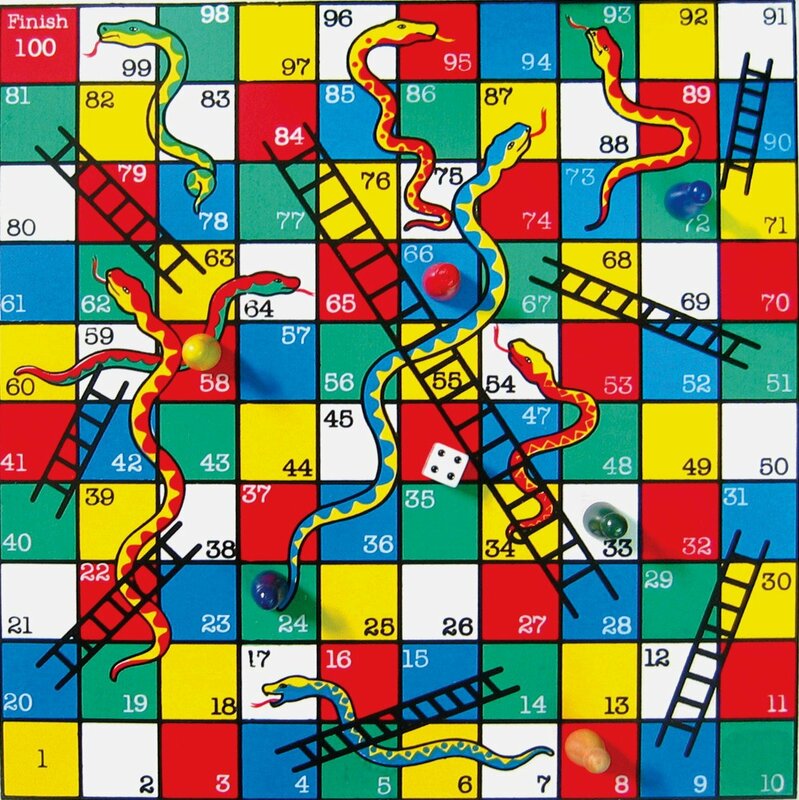 Have a good look at the Snakes and Ladder board below, we will be using it as an example throughout this post. 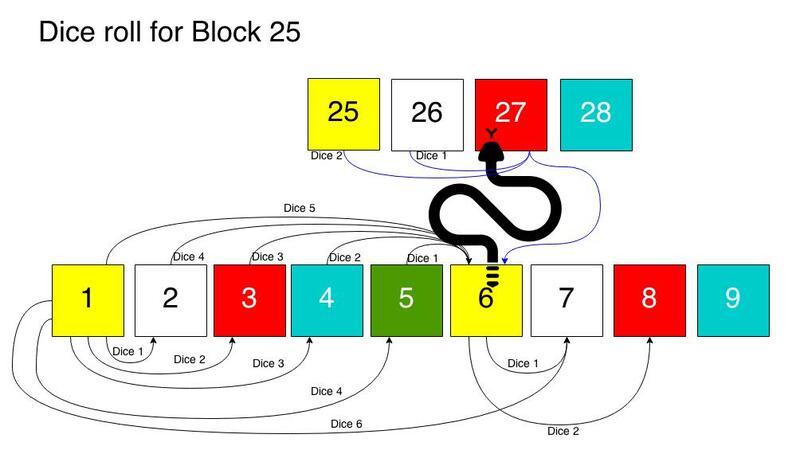 If you roll 5 from block 1 you will jump directly to block 27. So is for block 2 when you roll out 4, or, block 3 when you roll out 3 and so on. Now, “logically” speaking, the block 6 does not exists in our graph…! Think about the statement for a while. 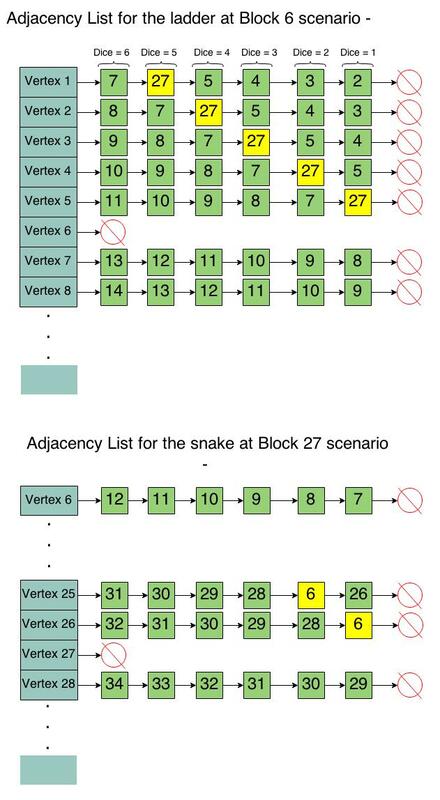 Whenever you reach block, you are directly jumping to block 27, you don’t stay there. Now, if you were constructing an Adjacency List for this graph…. In the list of adjacent vertices for Vertex 1, would you have Vertex 6 in the list, or Vertex 27…? Vertex 27 of course…! Being at Vertex 6 means being at Vertex 27…! That is why, our edge arrow did not end at Vertex 6… See it…? One more thing, in your Adjacency List, in the list of adjacent vertices for Vertex 6, what would you have…? Nothing…! Because you cannot come to a situation where you would have to stay on Vertex 6 and roll the dice. So the adjacent nodes list corresponding to Vertex 6 should be empty. These two things are very important, when you implement the Adjacency List for the Snake and Ladder board. We assume that getting caught by a snake is always unfavorable, and will not add to the progress of a short path. Just to get a better idea of the scenario of a ladder and snake, I have depicted what the Adjacency List would look like for the above two examples shown in the pictures. respective edges concerning the snakes and ladders one-by-one. eplace the corresponding edges as I depicted in the pictures above, for that, I replaced the Vertex n‘s edge with the new value, in Vertices (n – 1), (n – 2), (n – 3), (n – 4), (n – 5), (n – 6). Because it is only in these vertices that you can find an edge of vertex n.
I put all this replacing stuff in a function replace() which takes the Linked List and searches for a value ‘num’ and replaces it with the value ‘replaced_num’ when it finds it. I backtracked from Vertex 100, finding who it’s parent was, then, who the parent’s parent was and so on to find the path and finally printed it in reverse order.